It never fails: I can’t walk into a Costco without spending at least a few hundred dollars. This weekend was no exception either. My wife and I hit up the local warehouse store to stock up on some canned goods, snacks and other food and of course I left there with a new gadget: I bought a 64 GB Dell Venue 8 Pro with folio case for $299.99. I’m not yet sure if I’ll keep the device — Costco has a very generous 90-day return policy — mainly because I’m not sold on the need for a Windows tablet for what I do. But if I do take it back, it won’t be because the slate is a bad product: I’ve used it heavily over the weekend and it’s the best Windows 8.1 tablet I’ve tested to date, a list that includes other slates from Lenovo and Toshiba. Here are some initial observations in no particular order. Most Windows tablets in this size use a 1280 x 800 resolution panel and the Venue 8 Pro is no exception. However, it’s an outstanding, bright IPS screen with great viewing angles. Touch is very responsive on the screen, which supports 10 simultaneous touch points. An Intel Atom chip and 2 GB of memory are standard fare for 8-inch tablets running Windows 8.1, so the Dell doesn’t differ much here. Dell chose the Atom Z3740D to power the device; a quad-core chip clocked at 1.33 GHz with turbo-boost up to 1.83 GHz. By comparison, Lenovo uses a slightly faster Atom Z3770 chip in its $399 ThinkPad 8.3 tablet: That chip clocks at 1.46 GHz with a boost up to 2.39 GHz but you’d be hard pressed to see a performance difference. Out of the various Windows slates I’ve looked at, I like the Dell’s design the most. This is a light, slim tablet with nice rubberized back and rounded edges. It weighs 395 grams (0.87 pounds) and measures 216 x 130 x 9 millimeters or 8.5 x 5.12 by 0.35 inches. Essentially, this is a full Windows 8.1 machine in a size very comparable to an iPad mini. The device does get warm in one particular spot on the back. It’s not what I’d call hot enough to be annoying but it’s definitely noticeable. Dell says the Venue 8 Pro should get up to 8 hours of run-time on a single charge. So far, my experience matches up with that claim although I like to fully cycle the battery of a device several times before doing an official battery test. Still, I was able to use the tablet on and off for a full day on a single charge. 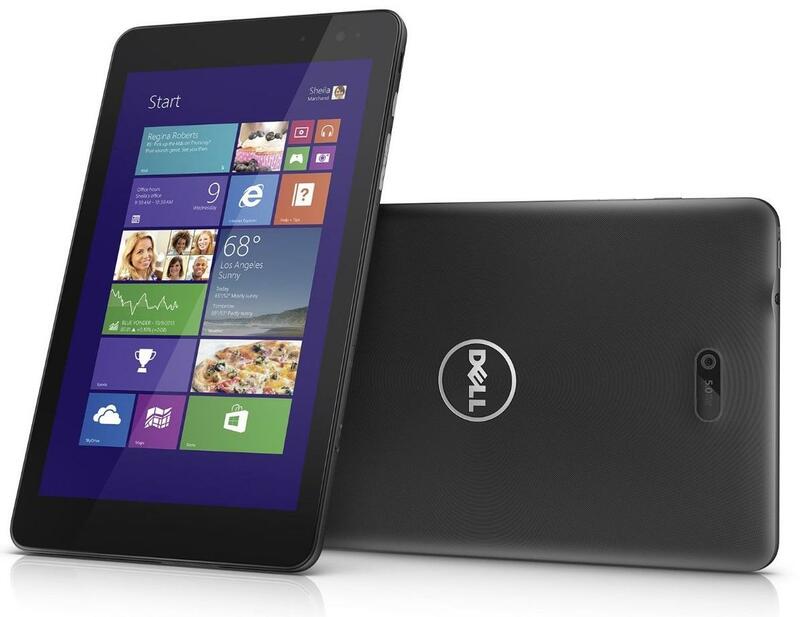 Just like its peers, the Dell Venue 8 Pro comes with Microsoft Office Home & Student 2013. The apps run pretty well on the device but I’ll be happier when Microsoft launches a more touch-friendly version of Office for Windows. Still, if I needed to update a Word document or Excel spreadsheet, it’s easy to do on this tablet. Unlike other Windows tablets, there’s no Windows button on the front face of the slate. Many have a capacitive button that, when pressed, brings you back to the Start screen. 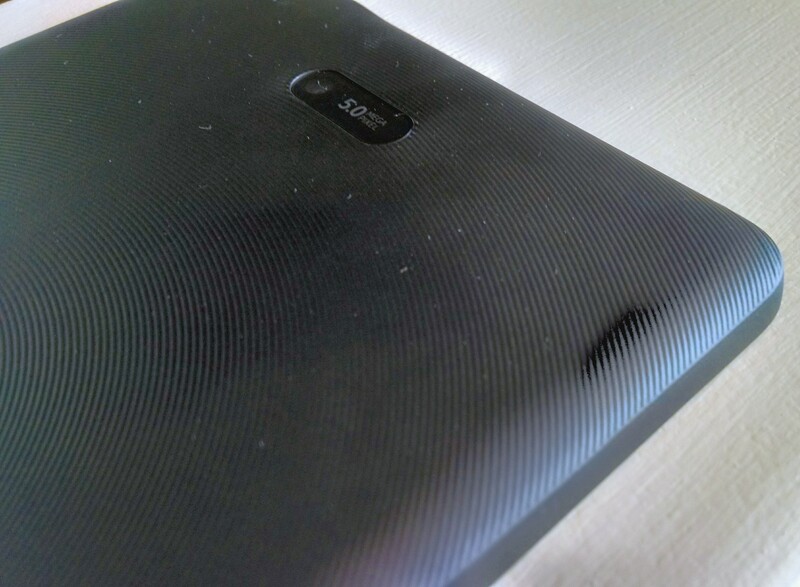 Dell opted for a small physical button on the top side of the device. I don’t particularly care for that design choice. I also wished Dell had put in a second speaker. There’s just one so if you’re going to listen to music or watch videos, you’ll want to use headphones. With headphones on, the sound is quite good. There’s a single micro-USB port used for data transfers and charging the device. Dell includes a small 10W charger with the tablet. Dell charges $40 for the folio case that Costco included. 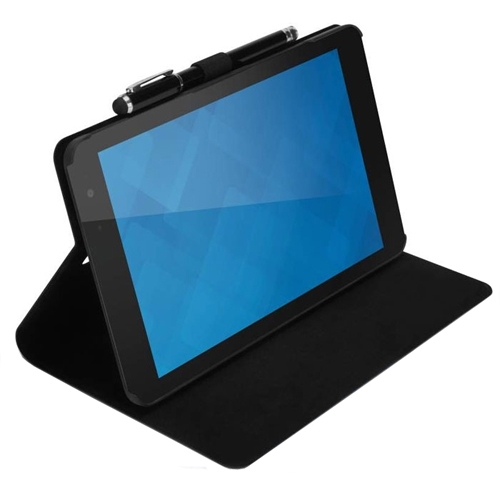 It’s not bad and particularly useful for propping up the tablet to watch videos or to use as a traditional PC. Ideally, you’ll need a wireless mouse and keyboard if you plan for that; Dell sells small wireless keyboard for $99.99. 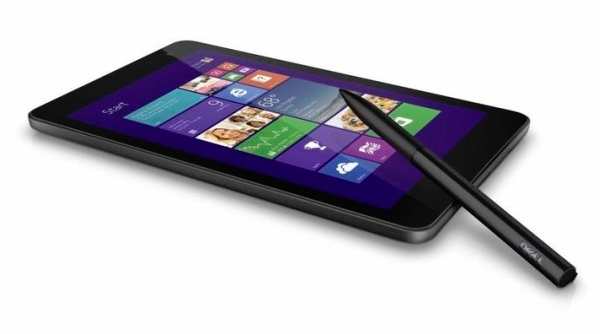 Dell also sells an active stylus for the Venue 8 Pro but I haven’t bought one. I’ve read dozens of posts about initial problems with the stylus, however, the company says it has addressed them with a software fix. The tablet has a pair of cameras — 5 megapixels on the back and 1.2 on the front — which is handy for basic photos and video-conferencing through Skype or other apps. I tested the front camera on a Skype call and the experience was pretty solid. You don’t get integrated mobile broadband at this price, so it’s Wi-Fi for connectivity. The Venue 8 Pro supports dual-band 802.11n Wi-Fi which tests pretty good on my home network. I get faster speeds with 802.11ac devices but Wi-Fi performance is fine on this tablet. Back in 2007, I spent $1,200 on what was then called a UMPC or Ultra Mobile PC. These were 7-inch tablets with resistive, not capacitive, touchscreens that ran Windows. They were up to an inch thick and often ran out of battery within 3 to 4 hours. Fast forward to today and for 25 percent of the cost you can get a lighter, thinner Windows computer good for all-day mobile use. Based on what I’ve seen so far, the Dell may be the best of the bunch. If I had to pick one to carry around with me, this would be it. Again, I’m not sure I need a Windows tablet. I use an iPad Air for most of my tablet content consumption and a Chromebook for work: Nearly all of the content I produce is done in a browser. Over the next three months we’ll see if the Venue 8 Pro wins me over and finds room in my stable of devices; I suspect the new Windows 8.1 update will have much to do with that decision because Microsoft has definitely improved the overall software experience. And even with just a short time using the Dell tablet, it reinforces my personal opinion that Microsoft doesn’t need to make a Surface Mini slate, particularly if the device will run Windows RT. It will be a challenge for the company to bring such a tablet to market for much less than the Dell Venue 8 Pro costs (the 32 GB model is $249.99 direct) and offers more flexibility for consumers and enterprises alike since it runs the full version of Windows 8.1 with support for older apps.